The original US routes were officially approved on November 11, 1926. The main purpose of this page is to explain why four of the routes included on that list were probably never signposted: US 109, US 711, US 622, and US 630. More broadly, this page also reviews the source material available for the study of US routes during the nascent years of the system. And it demonstrates that the 1926 list was by no means "final". Rather, ongoing changes and refinements continued to be made, some of which were implemented within weeks or months after that list was approved. The pre-existing basemap already included the names of each state capital, as well as some of the major cities. However, the roman font used for those cities was different than the italic font used for the majority of placenames on the map. Also, some of the toponyms that were included would not normally have been shown on a map of such small scale, indicating that they were important only for the specific purpose of the map. Some examples include Ft. Kent ME (north terminus of US 1), Van Horn TX (west terminus of US 90), Midland SD (west terminus of US 14), Belfield ND (junction of US 10 and US 85), and Armington MT (where US 87 split into US 87E and US 87W). All of this suggests that most placenames were added by the cartographer who produced the AASHO map (in addition to the red highway lines and US route numbers). Although we have only this map (and not a list) of the US routes that were approved in Nov. 1926, we do have a list that was printed about five months later (April 1927) in American Highways (reformatted for the web here). 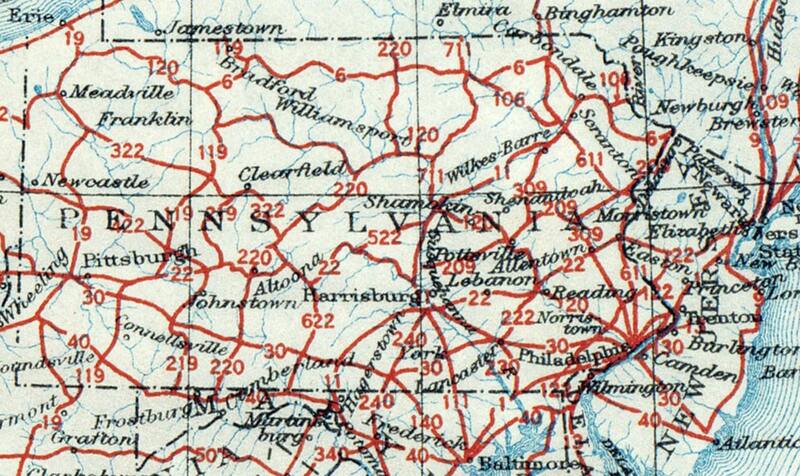 US 6 and US 120: the 1926 map showed US 120 between Philadelphia and Erie. US 6 was shown between Matamoras and Kane, where it ended at its junction with US 120. 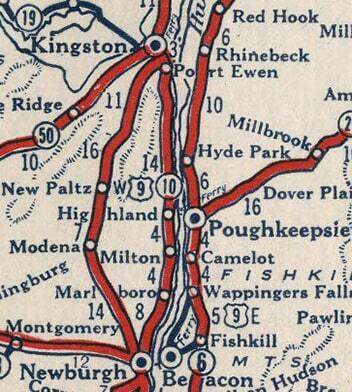 But the 1927 list had US 6 extending both east (to Kingston NY) and west (to Erie). And the west end of US 120 had been truncated to Ridgway, at its junction with "US 119" (which was actually US 219; see next entry). 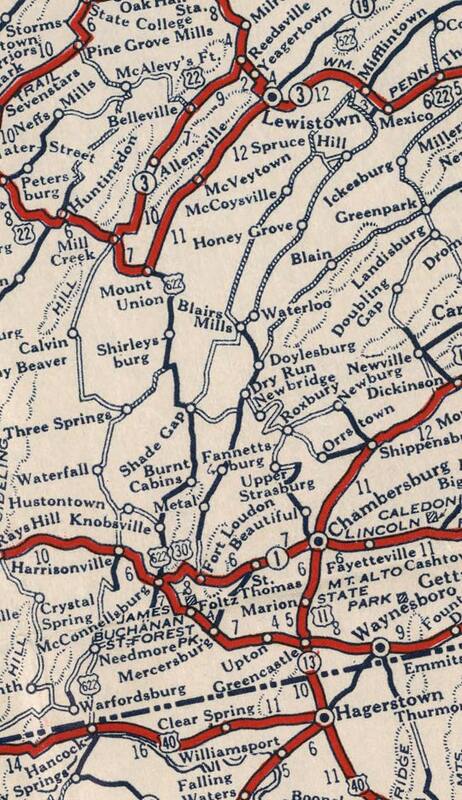 US 119 and US 219: the 1926 map showed US 119 from Morgantown WV, through DuBois PA, to the NY state line near Bradford. US 219 was shown between Grantsville MD and DuBois, where it ended at its junction with US 119. But the 1927 list had US 119 ending in DuBois at its junction with US 219. And it was US 219 that continued north to Bradford. ...but the 1927 list had US 220 following its current route east from Williamsport up to Waverly (replacing the entirety of "US 711"). US 111 had been extended north from Harrisburg up to Lawrenceville. US 611: it should be noted that US 611 was shown on the 1926 map, but not on the 1927 list. I suspect this route was inadvertently omitted from the 1927 list. Both of those anomalies were also shown on some early commercial maps, even though probably no US 109 shield ever saw the light of day, and US 7 was probably never actually signed anywhere in New York state. As an example, this next map showed both US 109 and US 7 in NY. 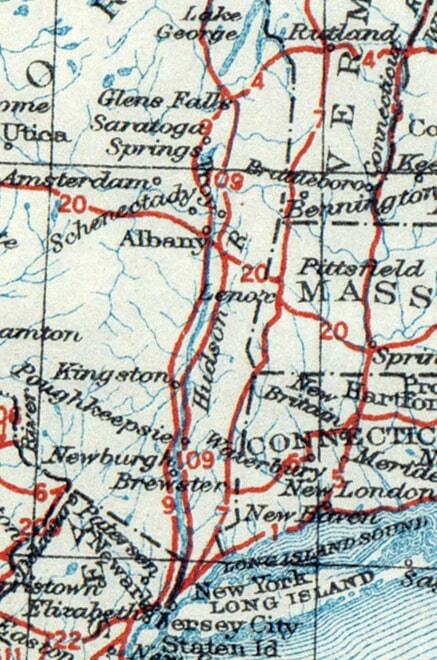 ...but the 1927 list indicated that Norwalk CT was the south terminus of US 7 (not NYC). US 95 was shown heading south to Weiser, then continuing along the east bank of the Snake River, ending in Fruitland at its junction with US 30. US 30 crossed from Fruitland to Ontario, then continued north along the west bank of the Snake. At Weiser Junction OR, one could use "US 630" to cross the river into Weiser ID. This route was only three miles in length, meaning US 630 would have been the shortest-ever mainline US highway. But it is unlikely that the designation lasted long enough that it was ever signposted. 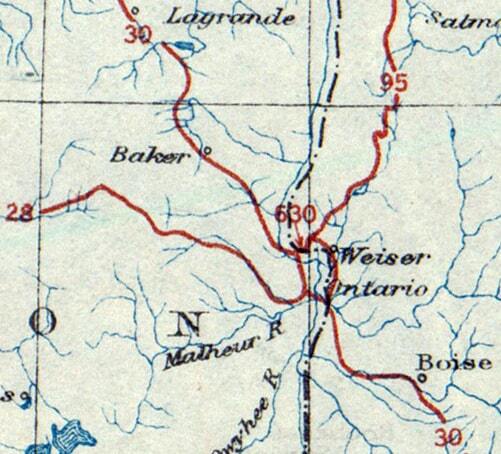 Already by the time of the 1927 list (just five months later), US 630 was no longer shown, US 95 was said to end in Weiser, and a new US 30N designation had been added. 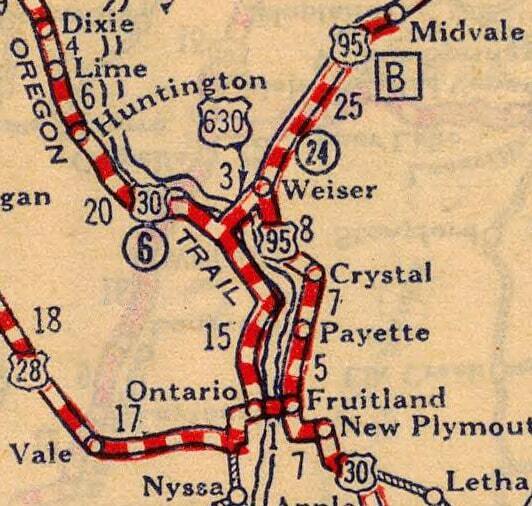 In other words, US 30N went north from Fruitland to Weiser, along what was originally planned as US 95. From there, US 30N crossed over into Oregon via what had been planned as US 630, and ended where it re-connected with US 30.
last updated Jan. 23, 2019.